Burn After Reading, the Coen brothers followup to their best picture winner, No Country for Old Men, has a very serious plot. A former CIA analyst named Osbourne Cox, played by John Malkovich, is writing a memoir of his days with the company. His wife, Katie (Tilda Swinton), is secretly pursuing a divorce, and makes a copy onto disc of files from his computer, including the memoir and some classified materials. A secretary at her lawyer’s firm loses the disc at a gym, where it is found and comes into the possession of Chad (Brad Pitt), a personal trainer. Chad enlists his colleague, Linda (Frances McDormand), in a scheme to extort money from Osbourne in exchange for the disc. Meanwhile, Katie is having an affair with Harry (George Clooney), a Treasury agent who, coincidentally, meets Linda through an online dating service. It’s complicated, and only gets more so when plans crisscross and things inevitably go awry. The Coens are no strangers to material like this. Consequently, they’re among a small number of filmmakers who can handle it. The combined story arcs of crime and improbable coincidence are their bread and butter. Also, absurdity. Only a few of their films have played things straight, never straying into bizarre black humor. No Country was one. Blood Simple was another. 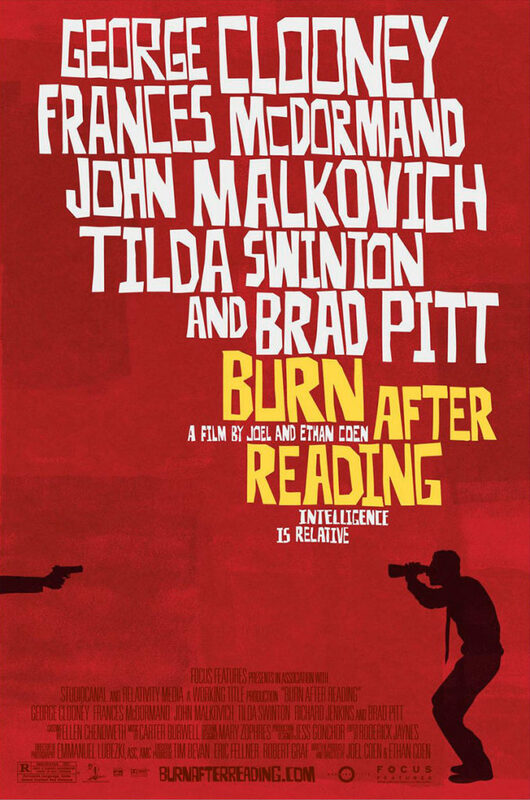 Burn After Reading would have been served well had it been treated as seriously as those two films. Burn After Reading has a very grownup plot, and very grownup things happen to characters as a result of the misguided decisions they make. The story is very much in the vein of tragedy. Yet the only two people who play things seriously are Malkovich and Swinton. They also seem to be the only pair who inhabit the story to the fullest extent possible. This isn’t to say there is anything at fault with the performances of Pitt, McDormand, and Clooney. Instead, such fault lies with the Coens, who crafted a film and demanded performances inconsistent with their own screenplay. It is a jarring mismatch. The Coens have made the absurd blend with the serious successfully before, but Burn After Reading begs for quirkiness to be set aside.